I am a big fan of The Critical Thinking Co. Each year’s school planning always includes a Critical Thinking Co. catalog with many dog-eared pages and post-it notes on products high on my wish list. This month I jumped on the opportunity to review The World History Detective Book 1 – Ancient and Medieval World Civilizations. 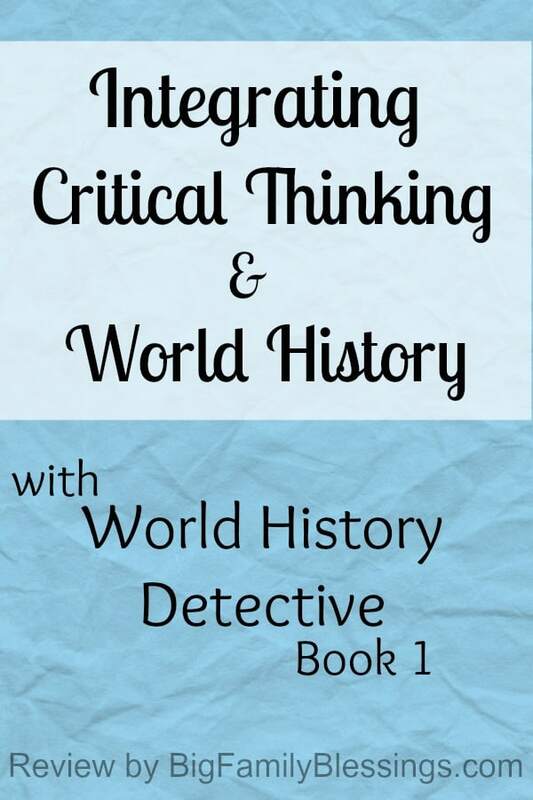 Plan to use World History Detective Book 1 either as a stand alone textbook, or as a supplement. While content skills are based on typical 6th and 7th grade standards, the text also makes a nice refresher or review all the way through 12th grade. The lessons begin with text to read about one historical topic. After reading the information, students apply critical thinking skills to answer questions based on their reading. Unlike traditional history texts and questions, students must apply critical thinking to answer the multiple choice and essay questions provided. Each lesson includes short essay questions, similar to those found in college level or AP classes. These questions help students develop writing skills that will improve critical thinking and writing across all of their academic subjects! The content maps included in all of the lessons are invaluable for the visual learner. Timelines, maps, and other visual charts aid in organizing and learning important information. With 78 lessons, the book schedules nicely as a stand alone text for one year, completing approximately two lessons a week. As a supplement the book will last about two years when completing one lesson a week. I took the supplement route with my 11-year-old daughter, as we already have a history text that we enjoy this year. World History Detective Book 1 is a perfect supplement for K12’s The Human Odyssey Volume 1, which also covers prehistory to the middle ages. We really enjoy spending one day a week completing a complementary lesson from Critical Thinking Co.’s World History Detective. I love the connivence of perforated pages in this book. That makes my life so much easier, since we tear out all of our work and place it into a weekly binder for more mobile schooling. I also appreciate the copyright on this book. Copies are allowed for family use in one home (or in one classroom for school teachers), so I can make copies and save the book to use with the rest of my children. Those perforated pages also make for easy copying- I just place the pages in a binder with page protectors after copying to keep the book nice and easy to use for future children. Now, lets discuss the content of World History Detective Book 1. Being halfway through our history for the year, I chose review topics for the first three weeks of using this curriculum, and the last three weeks chose lessons based on topics my daughter is currently studying. I find, especially in ancient history, the civilizations start running together in both my daughter’s and my memory. Our discussions often include questions like, “Wait, was that the Babylonians or Hittites?” Using this curriculum as a review helped both of us organize the ancient civilizations in our memory. Our first three review lessons were Fertile Crescent & the Sumerians, The Persian Empire, and Ancient Egypt. Not only are the essay questions great for developing essay skills my daughter will need as she takes college level classes, they also provide great starting points for discussion. We discussed the three greatest contributions Sumerians made to future civilizations, and how highways and couriers made it possible for Persian kings to know what was happening in their empire. We both appreciated the timelines in the Ancient Egypt lesson which help keep rulers and important dates in perspective. For the next three lessons, I chose topics my daughter is currently learning about- Ancient Greece:Athens, Ancient Greece: Sparta, and Persian Wars. Again, the inclusion of visual learning tools impressed me. My daughter used a Venn diagram to show similarities and differences between the Athenian government and the US government. The Persian Wars lesson included a chart and concept map to organize the battles, rulers, and allies. Overall I am very impressed with World History Detective Book 1. I look forward to using the book for the next two years with my oldest daughter, and again as the next five children reach middle school! It is definitely the perfect fit alongside K12’s The Human Odyssey Volume 1.